But for the people who rabidly embrace the doctrine of human-caused global warming, none of this matters. For them global warming was never really about science or data. It is about power. Man-made global warming is a powerful justification for a massive expansion of government controls over human activities. That is why the ruling classes, from Al Gore to the editorial writers at the New York Times, who know nothing about science, so heartily embrace it. The United Nations sees global warming as the ticket to attaining the power of a world government. That is why the UN doctors the reports of its science panels. But what this massive increase in government power would mean is a dramatic loss of freedom and prosperity for average working people the world over. Global warming regulation, in fact, would involve a massive assault on the standard of living of the middle class, particularly in America. That is why this battle is so important. In case you missed the release of the 2016 Democratic platform, the use of federal government agencies to punish those who disagree with them on “Climate Change” is their regressive progressive reality and many of their climate change cohorts have already launched their assault on Exxon Mobile. This use of insidious, legal force is spearheaded by none other than the Climate Change charlatan, Ted Lieu, Democrat Congressman of Ca, who was the chief architect of the expensive and dangerous California Bill AB-32. 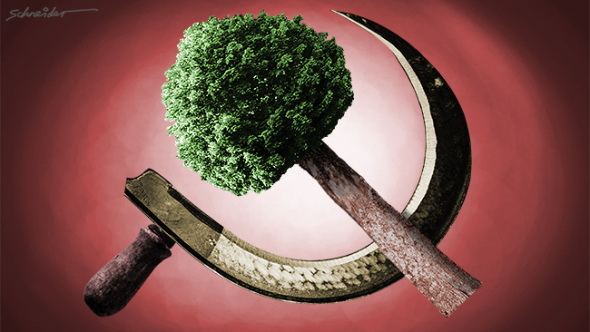 For those unfamiliar with AB-32, it is hailed as landmark legislation in the progressive’s fight to control the climate through taxation and regulation (aka the massive transfer of wealth from industry to government bureaucrats and their wealthy cronies). According to CA AB 32 and its’ authors, energy companies and consumers need to be controlled, regulated, and taxed by CA state agencies referred to as the Climate Action Team. This “landmark” legislation has done very little to help the planet but has, in fact, put many trucking companies out of business, mandated a diesel filter which caused deadly truck fires, and has empowered the lying Climate Cronies. Yet, control, costly regulation and taxation is simply not enough. Now these companies and individuals, who may offer a difference of opinion and opposing scientific studies must be persecuted and punished for their dissent. 19 Senators will take to the Senate floor to call out Koch brothers- and fossil fuel industry-funded groups that have fashioned a web of denial to block action on climate change. Despite polling that shows over 80 percent of Americans favor action to reduce carbon pollution, Congress has failed to pass comprehensive climate legislation. The Senators will each deliver remarks detailing how interconnected groups – funded by the Koch brothers, major fossil fuel companies like ExxonMobil and Peabody Coal, identity-scrubbing groups like Donors Trust and Donors Capital, and their allies – developed and executed a massive campaign to deceive the public about climate change to halt climate action and protect their bottom lines. As part of their effort to draw attention to the web of denial, Senators Whitehouse, Markey, Schatz, Boxer, Merkley, Warren, Sanders, and Franken are introducing a resolution describing and condemning the efforts of corporations and groups to mislead the public about the harmful effects of tobacco, lead, and climate. The resolution also urges fossil fuel corporations and their allies to cooperate with investigations into their climate-related activities. Congressman Ted Lieu (D-CA) is introducing the resolution in the House this week. According to the press release by the DNC: Use #WebOfDenial and #TimetoCallOut to follow the speeches on Twitter. Presidential candidate Senator Bernie Sanders and Congressman Ted Lieu separately wrote to Attorney General Loretta Lynch urging a Department of Justice probe of Exxon. In a letter to Lynch, they write, “If these allegations against Exxon are true, then Exxon’s actions were immoral. We request the DOJ investigate whether ExxonMobil’s actions were also illegal.” Lynch has since sent their request to the FBI for review and investigation. Exxon Mobil already has received a subpoena from NY AG Eric Scheiderman for documents dating from 1977. Schneiderman has at his disposal New York’s Martin Act, a law that gives the state’s attorney general broad power to prosecute companies for financial fraud. Unlike federal securities law, the New York statute does not require the state to prove that a company intended to defraud — only that it misrepresented relevant information or withheld it from investors. The law applies to any company doing business in the state. The AG from the Virgin Islands has also filed suit against Exxon. Thanks, Maxine, for finally telling us what climate change really is all about. Control.